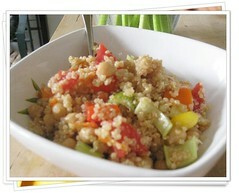 To cool the quinoa quickly, put the pot that the quinoa is in into cold water in the sink. Let it sit while you cut up the veggies. Mix it all together. In total, it takes about 20 minutes to make. Also, it tastes freaking awesome and stores well!